The body of the crocodile is extremely complex which is one of the main reasons why researchers really find it a challenge to learn all about it. Even so, it is a challenge that many of them are more than willing to be involved with. While they may look quite old and simple enough the inside of them gives us a completely different story. First, it is important to mention that the crocodile has a cerebral cortex. This is a type of tissue in the brain that we know is linked to intelligence, memory, and awareness. The fact that this animal is able to do so many different things and to have a high level of intelligence is due to this being in place. They also have a four chambered heart. With a body that is symmetrical and streamlined, they are excellent swimmers. They have very short limbs which is why they seem much slower on land. Most of the time their movements in the water are below the surface where you can’t observe it. They have webbed feet that are well designed for movements in the water, especially in the shallow parts of it. You may be curious about why they don’t end up swallowing lots of water as they move through it. This is because they have what is called a palatal flap which is very strong tissues found at the back of the mouth. They also are able to close their nostrils when they go below the surface of the water. The scaly looking skin that they have featured lots of pores all over it. They have sensory elements that help them to identify what is around them in any given environment. Most experts agree that this is one of the reasons why the crocodile is so adaptable and able to survive for millions of years. The teeth of a crocodile are extremely sharp. They have the ability to use them to hold onto their prey as well as to rip it apart. It is the power of their jaws that do most of the work though. Once they clamp shut it is almost impossible to get them to open back up until the crocodile is ready to do so. This is why they are known as having the strongest bite of all animals in the world. There are salt glands found on the tongue. Most people assume that crocodiles can’t make any sounds at all. While they are quiet most of the time that isn’t always the case. They can make some types of calls when they are defending themselves and when they are in distress. There is a part of their overall anatomy that allows them to find their natural habitat. Even when they have been relocated they may venture back to that original location. Another interesting aspect of the crocodile anatomy is that they don’t have any sweat glands. To release heat, they need to have their mouths slightly opened. This is why they are often found sleeping with their mouths open. 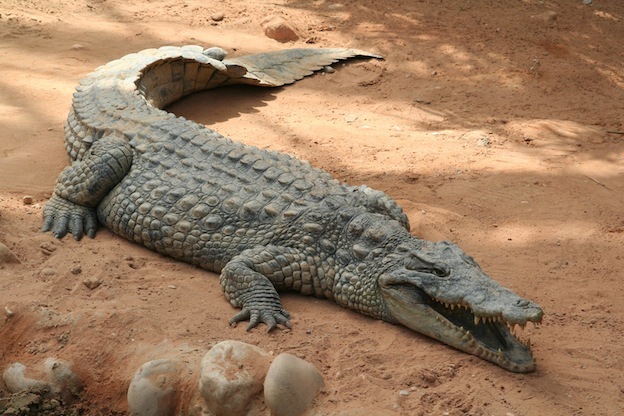 One mystery of the crocodile that remains is trying to determine how old they are. Experts haven’t found a way to learn from their bodies how to calculate age. However, it is estimated that they can live to be up to 100 years of age with the right conditions. They are often hunted due to the fact that their skin can be used to make a variety of leather goods. The belly of a crocodile though is very smooth.